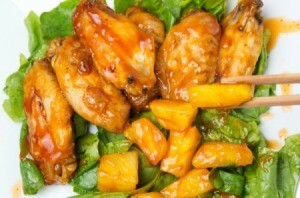 Bake your seasoned chicken and pineapple chunks in a mixture of soy sauce and pineapple juice. Can be served with rice. This is a guide about easy baked pineapple chicken. Makes for a tasty pinapple chicken. You can serve it with steamed rice. Preheat oven to 350F. Spray casserole dish with non-stick spray. Put the chicken in the dish and sprinkle with paprika, garlic and onion powder. Separate the pineapple from the pineapple juice. Mix the soy sauce and pineapple juice together and baste the chicken. Then pour the pineapple chucks on top of the chicken. Bake for 1 hour. Keep covered for the first 50 minutes. I'd just like to say I tried this recipe tonight and it was absolutely delicious. The chicken was so tender and juicy paired with the savory sauce and pineapple chunks. I also added some brown sugar to the mix, also served it with rice. I loved it and would definitely recommend it.